Read this... The Dominican Republic abandons Taiwan because China reportedly offered investments and loans to the tune of $3 billion while Taiwan offered Haiti $150 million loan to develop rural power grids... Haiti maintains ties with Taiwan at Beijing's expense. So... Who made the right decision here? Who made the right decision here: Haiti for holding on to Taiwan or The Dominican Republic for kicking Taiwan to the corner to strengthen ties with China? An article from the Huffington Post says Haiti's decision to maintain relations with Taiwan raises questions about possible missed development opportunities. While China snatches Dominican Republic from Taiwan in diplomatic blow, a CNN headline news reads, and Chinese Foreign Minister Wang Yi calls it "unprecedented huge potential opportunities for the Dominican Republic's development," Taiwan's Foreign Minister Joseph Wu told news reporters the Dominican Republic made a huge mistake acceptting "false promises of investment and aid by China." So... Who made the right decision here? 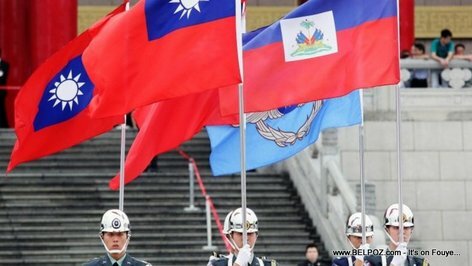 Haiti for holding on to Taiwan or The Dominican Republic for kicking Taiwan to the corner to strengthen ties with China? You people are so stupid you don't understand nothing.